I’ve been thining and thinking and thinking about what to do with this week’s stitch and finally realized, I was over thinking. 😉 Tonight I got down to business and started embroidering. I dug through my thread collection looking for a wool thread and realized, nope, that wouldn’t work. Then I got some YLI Candlelight and realized it was too thick for my idea. 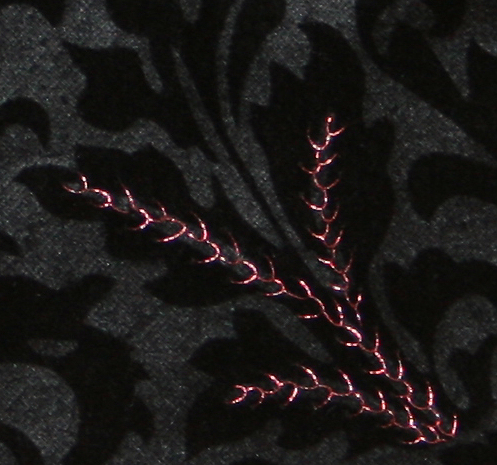 Then I tried some sewing thread – yes, sewing thread – YLI metallic copper thread. I’m really pleased with the effect. I wouldn’t want to do this for yards and yards of fabric, but it would be lovely for a patch in a crazy quilt block, and I think it would be wonderful on a jacket band. Not the entire length. I’d scatter a bit towards the bottom on one side and up by the face on the other side. A few inches of metallic thread embellishment would serve to draw attention to the areas on the jacket you desire. So no fabulous art piece was created, but I did experiment with different fabric, different threads, and learned what worked and what wouldn’t for this idea, and I had fun doing it. In my book, that makes for a successful TAST experience. This was my take on the classic fly stitch. 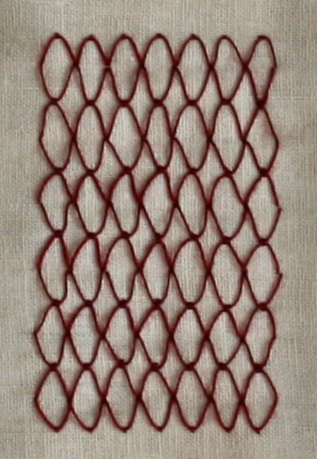 I elongated the stitch and made a very short tail on it – much like a stab stitch, so that it disappears in the embroidery. I worked one row, turned the hoop, and sewed in the opposite direction for the second row, making sure the needle went in the same holes at the top of the stitch as the previous row. There are lots of variations for this. 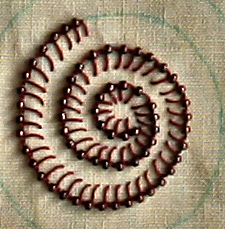 If I had made the stitch the same width, but halved the length, I would have ended up with a squatter, rounder effect. I like this diamond effect though, and plan on adding at least 2 more layers of stitching to this piece. Something will be added to the middle of each diamond, and where the little stab stitch is will have either a bead or a rounded stitch sewed with metallic thread. I don’t like using a hoop. That stitch lay beautifully in the hoop. The thread tension was perfect, and the stitches were nice and even. The minute I released the fabric from the hoop, the threads loosened and it wasn’t perfectly straight anymore. Obviously, I had the fabric stretched too tightly in the hoop. It was a spring hoop, so there wasn’t much I could do to loosen the tension. It was awkward for me to hold the hoop and sew at the same time too, but saying that, I will try a different hoop for this week’s stitch. This time I’ll try a hoop where I can adjust the fabric tension – a screw hoop. And I’ll make two samples – one with a hoop, and one without so I can compare results. Thanks so much to Sharon Boggins for offering this challenge again. I’m experimenting with lots of different ideas and the “what if I try this” concept will help me learn a lot more about embroidery. One of the things I do annually on New Year’s Day is to try and remember what I accomplished in the previous year, but today, found myself looking forward to what the new year will bring instead. 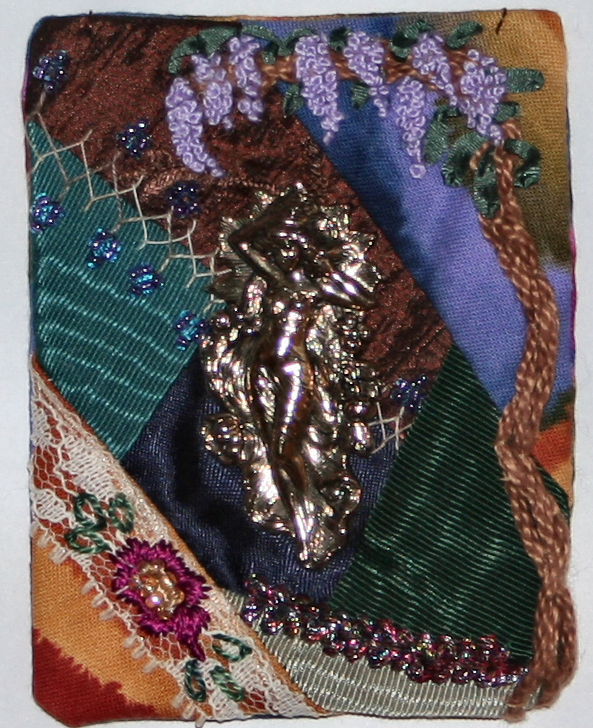 Two major creative challenges I’m participating in during 2012 are the Crazy Quilt Journal Project and Take a Stitch Tuesday. I enjoy hand stitching and am looking forward to both these activities. I’ve also signed up for a World Wide Crazy Quilt Round Robin – Build a Seam. Ricky Tims, Alex Anderson and Libby Lehman are coming to town this summer, and I sent in my registration for that. I’m going just for the experience of being part of one of their seminars. I’ve been a member of The Quilt Show since the beginning and would love to meet Ricky and Alex in person, plus I love Libby Lehman’s thread work. Another art quilt is in progress, and last but not least, my destashing is slowly but surely progressing. Regular blog readers know that I have a lot of “stuff” in my house. In my defense, I still have a business, and half of my “stuff” is my inventory. The thing is, I have a LOT of everything. I’ve been trying to lighten the load since 2005 and am proud to say another 229 pounds of my treasures have left the building. That makes for a grand total of 2,733 pounds out of here. I wish a very Happy and Healthy New Year to all of you.